Featuring accommodations with a terrace, Villa Saint-Pierre-De-Vassols is located in Saint-Pierre-de-Vassols. Providing free WiFi, the property also has water sports facilities and barbecue facilities. The villa features 4 bedrooms, a TV and a fully equipped kitchen that provides guests with a dishwasher, an oven, a washing machine, a microwave and a fridge. The villa also comes with a bathroom. The villa has an outdoor pool. There's a playground at this property and guests can go horse riding nearby. Avignon is 22 miles from Villa Saint-Pierre-De-Vassols, while Orange is 20 miles away. The nearest airport is Caumont Airport, 26 miles from the property. When would you like to stay at Villa Saint-Pierre-De-Vassols? This villa has a kitchen, microwave and stovetop. 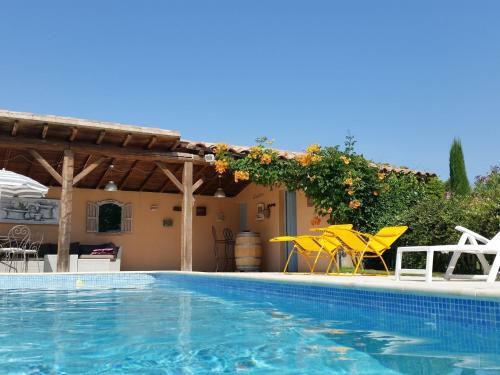 This charmingly furnished detached villa, situated among the vineyards with a view of Mont Ventoux, is 4 km from the little village of Saint-Pierre-de-Vassols, between the towns of Mormoiron and Bédoin. The villa has a lovely, well-maintained, enclosed garden with a grassy field, various trees and a covered terrace. The attractive fenced private swimming pool (10 x 4 m) is great for lounging or taking a refreshing dip. You will find many picturesque villages in the area, such as Crillon-le-Brave (2 km), Bédoin (5 km) and Vaison-la-Romaine (20 km). It is well worth your while to take a trip through the breathtaking scenery of this rolling countryside, where numerous vineyards alternate with old villages. In the little town of Mormoiron you will find a small recreational lake where you can fish and swim. Many hiking trails and cycling routes lead to majestic Mont Ventoux and 'Les Dentelles de Montmirail'. The antique town of L'Isle-sur-la-Sorgue (25 km), known as the Venice of France, is definitely worth a visit as well. The cities of Avignon and Orange are 35 km away. House Rules Villa Saint-Pierre-De-Vassols takes special requests – add in the next step! Villa Saint-Pierre-De-Vassols accepts these cards and reserves the right to temporarily hold an amount prior to arrival. A damage deposit of EUR 480 is required upon arrival – that's about 537.72USD. This deposit is fully refundable at check-out as long as there's been no damage to the property. We need at least 5 reviews before we can calculate a review score. If you book and review your stay, you can help Villa Saint-Pierre-De-Vassols meet this goal.